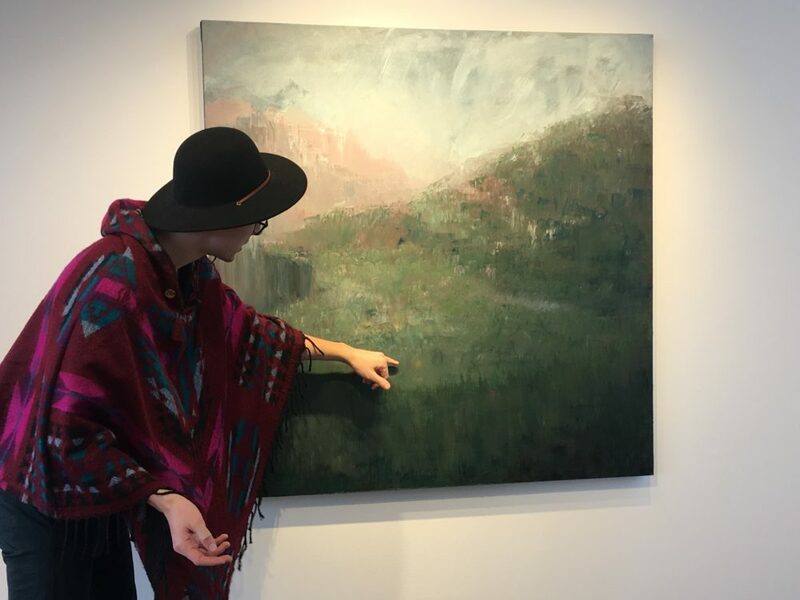 August Moehrke '18 explains the use of color in his work "Hummingbird Peaks" depicting an area of the Bighorn Mountains. Moehrke’s solo art exhibit, “August Henry: Hygge,” opens Friday, with a reception from 5-7 p.m. and an artist talk at 5:30 p.m. in the Schaefer Art Gallery at Gustavus Adolphus College. Through his work in watercolor, oil, and acrylics, Moehrke explores the idea of being present with one’s surroundings and what it means to be “home”. Throughout his childhood, Moehrke says he moved frequently, which changed the way he defined home. When he eventually stumbled upon the concept of “hygge,” it resonated with him. Hygge is Danish term for acknowledging the present through coziness, togetherness and familiarity, and he says it allowed him to expand his definition of home to a more flexible concept, not necessarily a physical place. “I began to find home and hygge through other means; in observations of natural landscapes, moss growth, and street lights on a river- the appreciation of the present,” he says. The 19 works featured in the gallery use the interplay of color and shape to evoke this concept, and invite the viewer to what Moehrke describes as the “overwhelming sensation that exceeds euphoria” when one is able to live in the present moment. This is Moehrke’s first solo exhibit and Friday’s opening reception also features live music and refreshments. Attendees are encouraged to wear their most comfortable sweater. The exhibit runs through February 16. So proud of you August !!! Good luck and gods blessings !!! Love ya August! So Flipp’n proud of you!!! That’s just wonderful, August. Your Mom and the rest of your family must be very proud of you. What a great accomplishment. So incredible August! What a wonderful way to express yourself. Amazing talent! This is amazing August!! Be proud it is quite an accomplishment!!!!! !